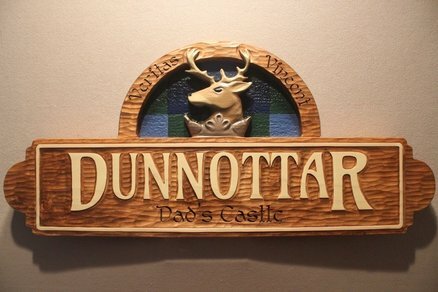 Custom Carved Wood Signs by Lazy River Studio. Here are a few signs with bear, deer, sheep, wolf, and misc animals I have carved. Signs are made from pine or cedar. The dall sheep sign is approx 6’ x 4’. All my signs are roughed by machine and then finished by hand. You can see that there was human touch at finishing carving. Beautiful work and awesome 3D effect. These are a wonderful collection of signs and they are beautifully done. Congratulations. Absolutely beautiful craftsmanship. Well done! These are really great, rustic as colorful. What does the text on this sign mean? As always, beautiful work Scott. Veritas (latin) is truth. Vincont or Vincent? Veritas Vincit would be Truth Prevails… Not sure what that second word is… Vincere is win or conquer.